For some moviegoers, Thanksgiving means more than turkey and plethoric tryptophan: it means a full multiplex packed with broad-appeal crowd-pleasing movies that film studios or distributors were competing to catch families' eyeballs at the end of the year. This round-up has a number of vetted ficks and confirmed new best Hollywood movies 2018 for Thanksgiving which are worthy a social call over the Turkey Day holiday if you're tired of defending lawn against zombie waves with peas and corns. Play Thanksgiving movies on iPhone/iPad/Android with high quality. 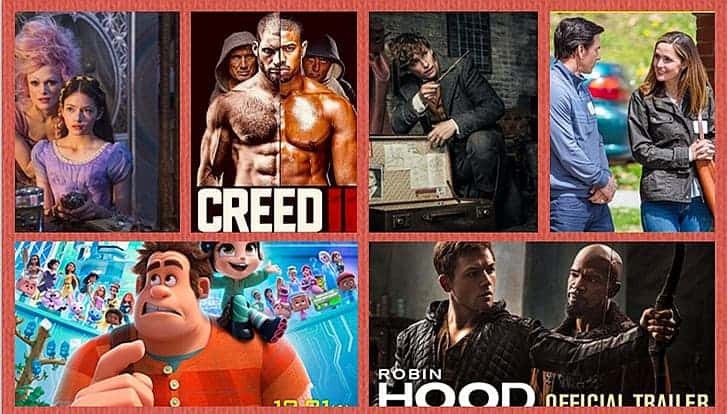 Ralph Breaks the Internet is a great recent movie that is good for this Thanksgiving 2018. Being the bad guy in the best-reviewed and the funniest video game, this time, Ralph starts an adventure inside the internet. Can Ralph and Vanellope find the spare parts they need? What hilarious story will they bring to us? You will need this Thanksgiving movie to watch with the whole family. The second installment of the "Fantastic Beasts" just joined the list of best new Thanksgiving movies chart. The 2018 sequel continues the adventures of Newt Scamander but this movie has a darker tone than the first one. The movie has received largely positive reactions. It's surely one of the best movies to watch together on Thanksgiving Day with teens, but there are some scary scenes that are not suitable for very young kids. If you think Thanksgiving is about expressing thanks among family members, don't miss 2018 Thanksgiving movie Instant Family. The movie is inspired by real events, telling a story about Pete and Ellie who adopt three kids and suddenly become parents. It's a heartwarming comedy and it reminds us that no matter who you are, the family is always somewhere special. The new Disney movie is a live-action adaptation of the classic Christmas ballet. Released early in November, it's also set to be a holiday movie for Thanksgiving. The movie, however, is not very well received, with very poor performance in the box office. But it's still a good movie especially for families and for holidays. If you haven't gone to the cinma due to the bad reviews, you can just download the Thanksgiving movie. Robin Hoood, Starring Kingsman's Taron Egerton and produced by Leonardo DiCaprio, gives you another choice than attending the Macy's Thanksgiving Day Parade. With the movie, you will see mind-blowing fight scenes as well as romance. Before you spend the holiday in the cinema, you can download the trailer of the Thanksgiving movie. The all-star superhero adventure is one of the most thrilling releases in 2018. This time, Avengers and their allies will face their most powerful enemy - Thanos. The movie is an ending and also a new start. Here's the secret to choosing the recent movie for Thanksgiving - you won't go wrong with superhero blockbusters. If you haven't watched it yet, you and your families will love it. The Grinch returns the holiday in a 3D animated comedy movie just in time. Dr. Seuss's classic book How the Grinch Stole Christmas!, the movie is a story about the Grinch who doesn't want Christmas tries to become Santa Claus to keep the peace and quiet. Released on November 9, it's not too early to see how the Grinch steals Christmas. If you want some revenge movie for Thanksgiving night, don't miss Creed II. The sequel has Rocky Balboa and Ivan Drago face-off again. In the movie, Adonis Creed will fight against Viktor Drago to get the honor of his father, who was killed by Ivan Drago. the movie features one of the series' most epic fights. Thor: Ragnarok is a great recent movie that is good for this Thanksgiving 2017. Being the best-reviewed and the funniest Marvel film, this superhero movie might be the best choice for a movie night. Thor and Loki return to the screen and fight to stop Hela and Goddess of Death from destroying the Asqardian civilization. Migue who dreams to be a musician finds himself in the Land of the Dead and unlocks his family story. Produced by Pixar and released by Walt Disney Pictures, Coco features colorful scenes and tops the best new Thanksgiving movies chart. With heartwarming story about family, it's the best movie for family to watch together on Thanksgiving Day. A group of space criminals must work together to stop the fanatical villain Ronan the Accuser from destroying the galaxy. Top movie to watch at Thanksgiving night if you want to get a head start on the holiday. Now you can copy DVD Guaridians of Galaxy without quality to Mac/PC/hard drive/iPhone, iPad, Android. Doctor Strange is Hollywood's most hit in 2016 and a must-watch movie for Thanksgiving. It grossed $85M its first weekend and dominates at box office race, making it the most-wanted new Thanksgiving movie out in 2016. It may be not appropriate for your kids to watch, however. Find out more Thanksgiving movies for kids here. This is the latest movie for Thanksgiving in 2016 from DreamWorks Animation and directed by Mike Mitchell and Walt Dohrn. It tells the story that Poppy (Anna Kendrick) and Branch (Justin Timberlake) set off a journey to rescue their friends after the Bergens invade Troll Village. Arrival is other best new film for Thanksgiving in 2016, which is out on November 11, 2016. Adapted from Story of Your Life, Arrival is considered as the most profound Sci-Fi film. If you are a Sci-Fi fan, it's worth to check out. Now, Arrival trailer downloads from YouTube, Vimeo etc. is available. The Good Dinosaur is another dinosaur movie second to Jurassic World this year, but also the movie second to Inside Out from Disney Pixar. Cannot wait to join the epic dinosaurs journey where an Apatosaurus named Arlo makes unlikely friends with a human. Since the release date of the new movie is close to Thanksgiving Day, why not download The Good Dinosaur and watch it offline with your family. The special bond that develops between plus-sized inflatable robot Baymax, and prodigy Hiro Hamada, who team up with a group of friends to form a band of high-tech heroes. Another animated kids movies suitable for Thanksgiving day to watch. The Disney animated superhero comedy soars to no.1 with sales just shy of 190,000, making it one of the fastest-selling titles of the year. Wanna preserve the disc but watch in at home? feel free to copy DVD Big Hero 6. So dinner's over and you feel nothing to do during food coma; Above new upcoming movies can provide comfort and closeness for a couple or family as they huddle together to eat popcorn and watch a Thanksgiving movie. The new movies in November will be arrived at theater according to release time but there could be a period of waiting before coming soon to DVD or Blu-ray. If you'd like to watch these new Thanksgiving movies on your computer, or liberate the DVD content from solid disk for streaming movies to handy finger-touch screen's devices like iPhone, iPad, Samsung Galaxy, Amazon Kindle Fire, Google Nexus, Surface etc. Here comes an ultimate solution - MacX DVD Ripper Pro has ready-to-use presets for all popular portables which enables you to backup and rip Thanksgiving movies in just minutes. Free download the Thanksgiving movie DVD ripper for Mac or Windows to backup/decrypt the newly released Thanksgiving movies. Click "Add" button to add DVD disk, or you are also allowed to add DVD folder or ISO image for Thanksgiving movies. Specify output folder on your Mac to save the output files. Click "Browse" button to choose the path where you want to save the output files in. Once the above steps are finished, you can click "Run" button to rip Thanksgiving movies to any video formats or portable devices in a matter of minutes. When the conversion is done, you can enjoy the new thanksgiving movies without DVD hanging out on the couch on the Turkey Day. 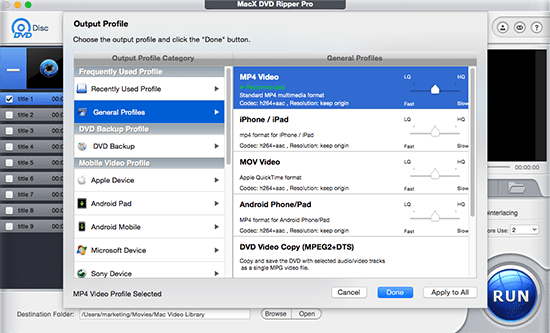 The best DVD ripper for Mac/PC is updated constantly to allow you to rip the latest copy-protected DVD, like Disney DVD protections and CSS encryption, so there is no worry about whatever and whenever the DVDs issued. It could perfectly backup DVD main title to a single MPEG-2 file for saving time and computer space while preserving original image quality. Note that we don't advocate any illegal copy. Free Download & Convert new movies, TV shows, trailers, music, more to TV, computers, mobiles and more!